It's no secret that your gut health plays a direct role in the state of your overall health. A number of different factors can play a role in your gut health, including dietary choices, frequency of travel, and whether or not you've recently used antibiotics. Probiotics can help restore gut health and should be a part of your daily vitamin regimen. Enterogenic Intensive 100 from Integrative Therapeutics is an ultra-high potency probiotic supplement that supports the replenishment and re-balancing of microflora throughout your intestinal tract for optimal health. 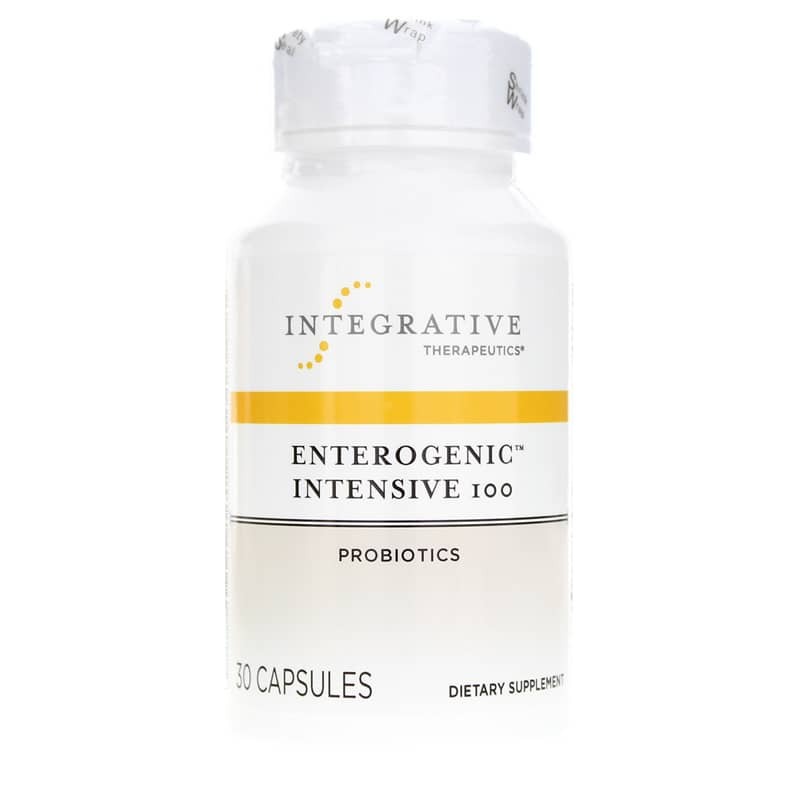 Integrative Therapeutics Enterogenic Intensive 100 has an enteric coating to ensure survival through stomach acid. The probiotic cells are released directly into your intestines for optimal benefit. Just one capsule every day can help you achieve and maintain optimal gut health. Made without any corn, gluten, sugar, wheat, or artificial preservatives or colors, Enterogenic Intensive 100 is the truly natural probiotic solution for optimal gut and intestinal health. Give it a try today! Other Ingredients: Aqueous coating (modified cellulose, sodium alginate, stearic acid, fractionated [non-hydrogenated] coconut oil, oleic acid), plant-derived capsule (modified cellulose), magnesium stearate, and silicon dioxide. May contain a minimal residual amount of milk and soy protein. Contains NO: corn, gluten, sugar, wheat, preservatives, artificial coloring. This product contains natural ingredients; color variations are normal. Adults: Take 1 capsule daily. May be taken at any time, with or without food, or as recommended by your healthcare practitioner. Keep refrigerated to maintain maximum potency. 100 billion CFU potency per capsule is guaranteed until expiration date when bottle is kept tightly closed and refrigerated. I have ordered this product for several years. This time the shipping package was different. The ice pack that I've always ordered with this product arrived melted. I will search for other companies to supply me in the future.